As mentioned in my previous post, this car seat is 10000% tried and tested, as it withstood the impact of a Lorry, and thank god, Noah remained completely unharmed. 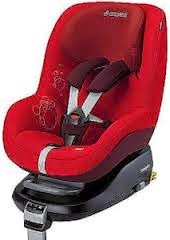 I do believe we owe a lot of that too the Maxi Cosi Pearl, as well as ISOFIX, and I will always recommend it for those reasons. If you haven't seen the Pearl, it's beautiful, it feels luxurious and I definitely wish they designed one for adults, mainly because it reclines! Yes, reclines! So on those long journeys when Noah drops off to sleep (those oh so rare journeys now, curse you toddler-hood) we simply pull a lever under his seat and he can lay back in comfort. I don't have to worry that he'll strain his neck if it drops forward, or that'll he will feel uncomfortable and stiff when he wakes, because he is just as comfy, if not more so, than he would be if he was sleeping in his pram. The extra padding around the head and neck ensures that in the horrific event of an accident, Noahs' head would stay completely supported which I can completely vouch for as when we had our crash, Noah was asleep. He didn't cry with the impact, he simply woke up and had a nosey around. My mind is completely at ease now I know he's strapped into that, the best thing is he'll be in it for another 3 years, as it's fit for use right up until the age of 4. Another huge and I mean huge plus, if your OH is anything like mine, is that the harness is so easy to clip in. John definitely can't work it out if something needs fifty thousand straps before your child is secure, so the Pearl is perfect, because two sides clip together and wa-la, you're all good to go. 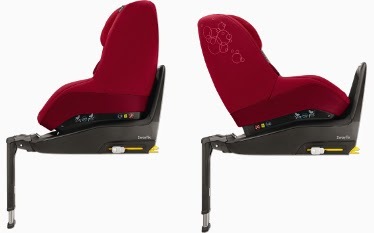 What more could you ask for with a car seat than complete comfort and safety for your child? The pearl comes in a huge variety of colours and designs, so there is always something to suit everyones taste. Do you have a Maxi-Cosi Pearl?